As expected, the school summer holidays are already a wash out! So we’ve done the hard work to bring together suggestions of what you can do in Swansea City Centre if the sun isn’t shining! Don’t forget to visit our EVENTS page for a full list of things to do too! And don’t forget the Boomerang Pass – return to the waterpark within 7 days of your visit and get half price entry to the waterpark! Have you ever wondered what goes on behind the big red curtains at the Grand Theatre? If so, then you’ll love the ‘Behind the Scenes’ tour on Saturday 15th & 22nd August at 10am. 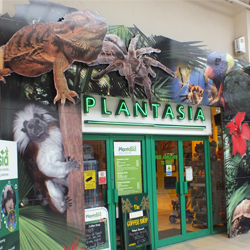 Explore the rainforest in the heart of the city at Plantasia. Walk around the Tropical Paradise, take time to learn about the plants and animals which call the beautiful Rainforests their home. Visit our events page for their latest animal antics events. Visit Swansea City Centre this Summer for plenty of things to do with the children!